Like all trails descending into the Grand Canyon, this trail is not ideal for running. It is quite long, relatively exposed, and can be extremely hot during the summer months. 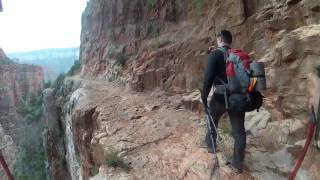 This trail is the second section of the AZT - Passage 38 - Grand Canyon - Inner Gorge, following the South Kaibab trail as the first section. The North Kaibab initially descends steeply down the head of a valley via a series of numerous switchbacks. After the lush verdancy and impressive views below the trailhead, the trail reaches the distinctive Supai Tunnel, where runners will find potable water (mid-May to mid-October) and pit toilets. Switchbacks continue to the massive cliffs of Redwall Limestone, where for long stretches the trail has been blasted out of the cliff in a half tunnel. The Redwall section is awe-inspiring with fantastic exposure and views. Where the bulk of the trail's descent meets the flatter bottom of Bright Angel Canyon, Roaring Springs is a worthwhile side trip. Here, water gushes forth directly out of the cliffs, cascading over moss and fern to form Bright Angel Creek. At mile 5.4 an unexpected house comes into view. The Pumphouse Residence, also known as the Aiken Residence, is where artist and park employee Bruce Aiken lived and painted for decades. In years past the lucky runner could get a refreshing cup of lemonade from one of the Aiken kids who were raised at the bottom of the Grand Canyon. Those fortunate to overnight at Cottonwood Campground will have the time to explore a beautiful oasis located 1.6 miles down-creek from the campground: Ribbon Falls is a true gem of the North Kaibab Trail. The waterfall is located in a grotto on the west side of Bright Angel Creek, so reaching it is a short but extremely rewarding side trip. Runners caught in the heat of the day should consider taking a siesta here from 10 a.m. to 4 p.m. Between Cottonwood Campground and Bright Angel Campground the trail enters the Inner Gorge, a narrow canyon where the trail is boxed in on either side by 1.7 billion-year-old Vishnu Schist. Though the trail here is not challenging from the perspective of elevation profile, be aware that this is a particularly dangerous stretch of trail during summer months. Because the entire 7.2 mile stretch is at low elevation, it becomes extremely hot from early morning to late afternoon. The gorge of black rock through which the trail passes becomes like an oven and can be compared to walking through a parking lot in Phoenix or Las Vegas in summertime. Always plan on reaching Bright Angel Campground before ten in the morning. At the rim, runners will glimpse the vast maw of Bright Angel Canyon through fir trees and aspen, ferns and wildflowers. As you descend, the ecology progresses into a blend of riparian and desert vegetation. Hiking down the North Kaibab. Some cool geology in Grand Canyon. Grand Canyon: Phantom Ranch - Cabin. Grand Canyon: Phantom Ranch Cabin. North Rim to South Rim hike!